In his book “The Soloist,” Steve Lopez calls it the “golden rule” in journalism: Everyone has a story. Lopez’s amazing story about profiling and befriending Nathaniel Ayers holds life-changing lessons for journalists and students. 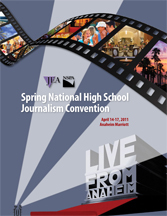 We’re thrilled to have Lopez as one of our keynote speakers at the JEA/NSPA Spring National High School Journalism Convention. Moreover, his keynote is sure to set the tone for the entire convention. What better way to learn about journalism than to talk to thousands of your peers, as well as hundreds of top-level educators and professionals? This program is your key to unlocking a successful convention experience. Look through the hundreds of breakout sessions for topics that interest you, or inspire you, or challenge you. Read up on our keynote speakers to develop insightful questions that will help you in your own scholastic journalism career. Find opportunities to unwind and socialize with newly made friends at a dance, or while watching a student film festival. Starting with the opening keynote Thursday evening, all convention activities will take place in the Anaheim Marriott Hotel. In addition to speakers and social activities, we have critiques, contests, a college fair and an exhibit hall full of journalism-related products and services. And don’t forget the surrounding area. Southern California is among the most bustling areas for news media and entertainment. We hope you get a chance to explore the area, whether that be to visit a local newsroom, sample local cuisine, or don a pair of mouse ears. Events such as this rely on hundreds of volunteers, and we’re blessed to have the help of scholastic journalism’s finest. Members of the Anaheim local committee, as well as dozens of others from around the country, have pledged their time and energy toward making this convention a success. If you see folks with name tags that say “speaker” or “local committee” or “staff,” be sure to tell them, “Thank you,” for all their hard work. There’s more you can do to help. As you take part in convention activities, we would love to receive your feedback. You’ll notice this program contains small boxes with four digits next to most activity descriptions. If you visit jea.org/eval on your computer or Web-enabled mobile device, you can enter that code and provide some feedback for each of the events you attend. But we encourage you not to wait for the evaluation to get the instruction you want. Raise your hand, ask questions and visit with instructors. In other words, talk to people. There’s no telling what you might find.